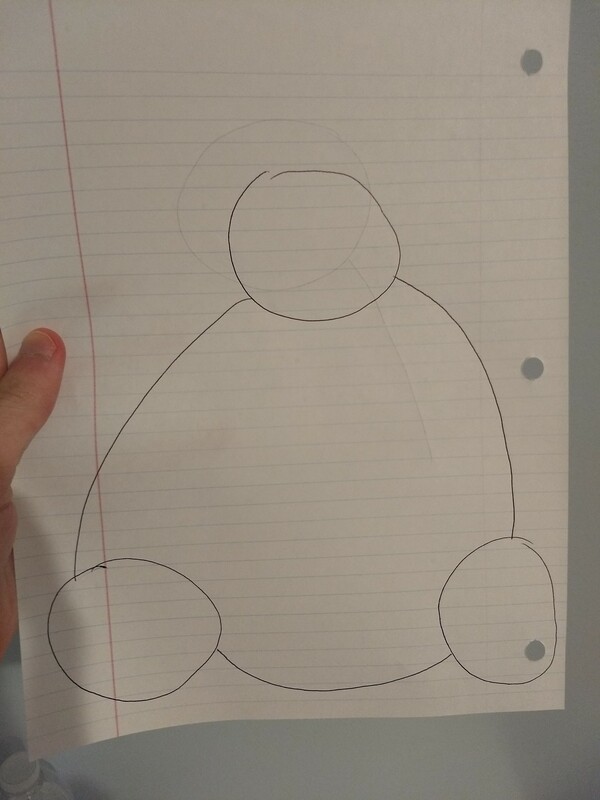 The shape you are trying to draw is a reuleaux triangle with circles on each corner. 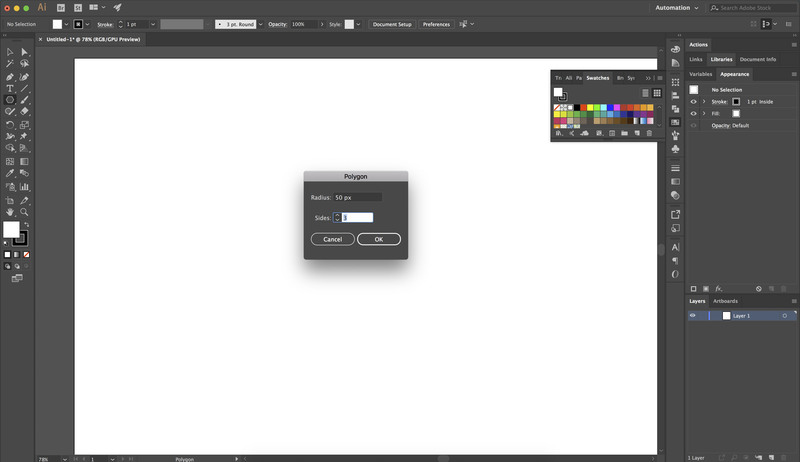 Seeing as you are asking if it can be done in Photoshop I am going to assume you have Illustrator as well. The main thing to remember is that a reuleaux triangle is fundamentally an equilateral triangle but with curved edges. So that is what we will create first. Using the eclipse tool, hold shift and draw a perfect circle around one of the 3 anchor points. Now we use the "Shape Builder Tool" Press and hold the Option/ALT key to delete the shapes you don't want. Add colours, adjust it to make it pretty! I would use a vector image editor instead. Photoshop could do it, but it's like using a hammer to screw in a nail. 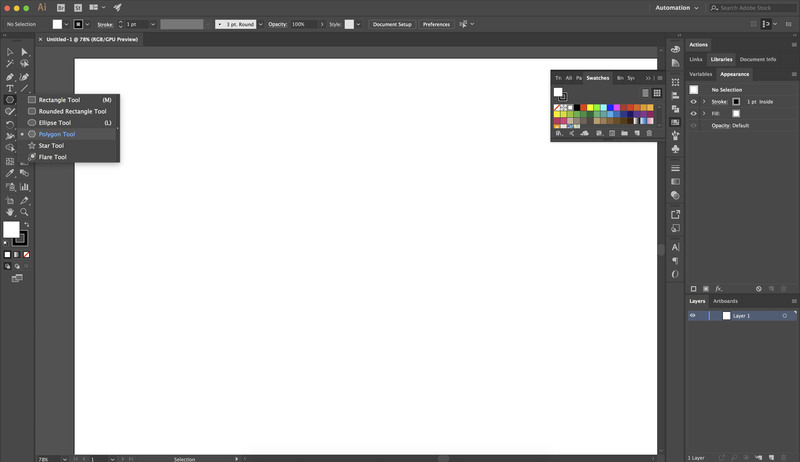 Photoshop only has very basic vector capabilities in comparison to proper vector image editing software. 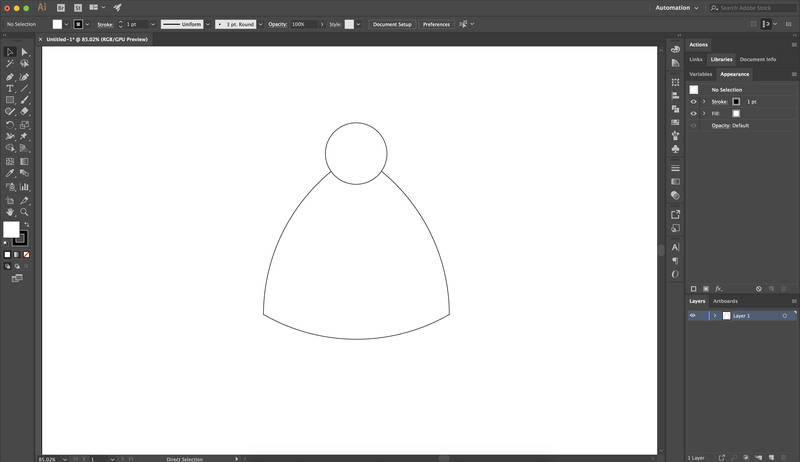 Although Illustrator could be used to do this, it is probably easier in Inkscape, since it has a Polygon tool, with a rounding option, which not only rounds the corners but also curves the edges. Update: The above example was made using Inkscape 0.48. 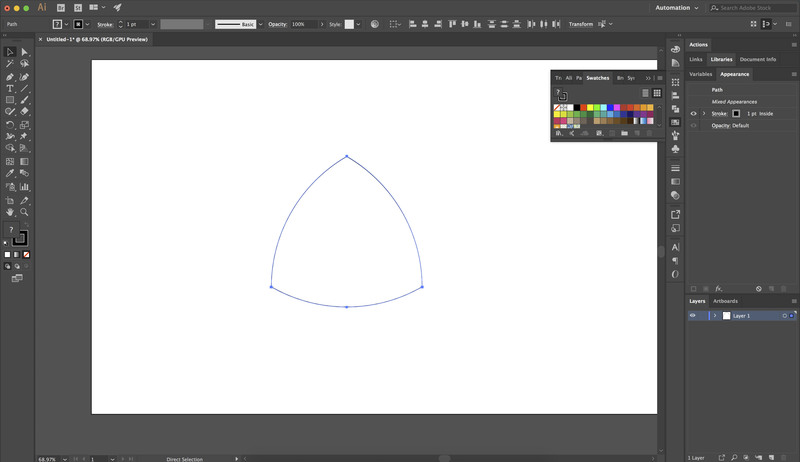 In the most recent version of Inkscape 0.92 the polygon tool works somewhat differently, in that rounded triangles have no nodes at the vertices, so there are a couple of extra steps required. 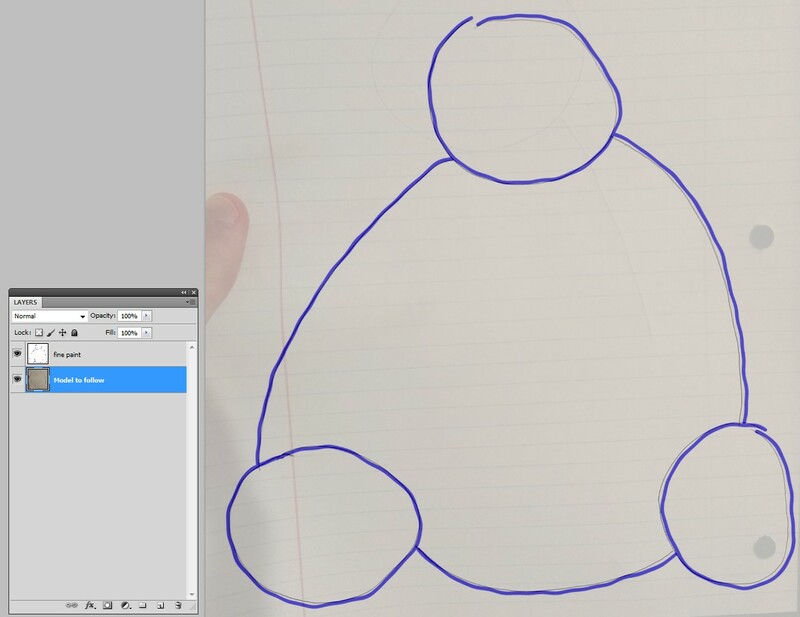 When you draw the triangle, adjust it to the desired roundness, then click Path > Object to Path, then Extensions > Modify Paths > Add Nodes, using the setting shown below. This will create additional nodes at the vertices for placing the circles accurately with snapping. But if you are after an exact 2D projection of a spherical triangle - even without a perspective - you must carefully calculate which elliptic arcs you shoud draw. Move the arcs to their places. They fit exactly if you have snap to endpoints ON. Insert the circles. Fill them, if you want to hide the corners. As well you can cut off the extras. 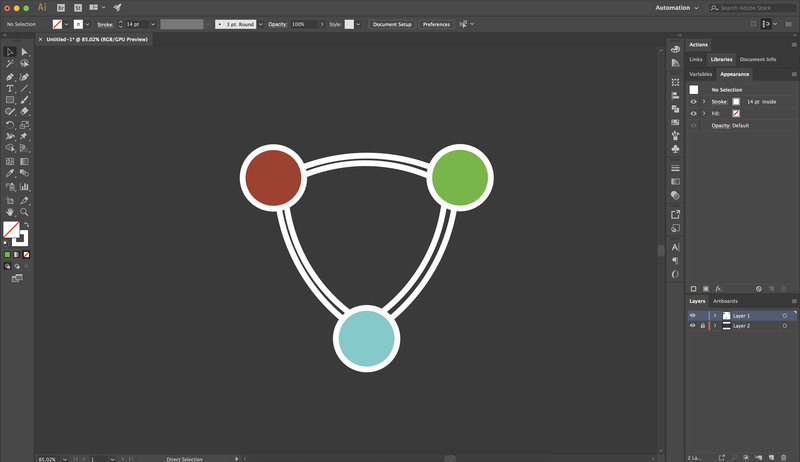 You must join the arcs, if you want insert vector color fills or subtract the circles. This image only demonstrates them. Some programs allow flood fills with a paint bucket => no joining is needed. Warning: in Inkscape that tool is inaccurate, it's only for screen resolution. Inkscape: How to overlay objects with transparent fill? How should I go about redesigning this graphic? How to achieve pixel perfect curves with Photoshop CS6? Does anyone know how to create this ripple gradient effect? How do i need to process an picture to make it look like the background of this site?